On Feb. 10, 2019, it is expected that Minnesota’s three-term senator, 58-year-old Sen. Amy Klobuchar is planning to announce she will be running for president in 2020. Klobuchar will be holding a rally in 18-degree weather on Boom Island, Minneapolis. People arrived at the event early with portable heaters and hot chocolate. In 2016, Minnesota went heavily for Donald Trump. Klobuchar is expected to discuss her working-class background in her speech. A former corporate attorney and prosecutor, Klobuchar will join other Democrats who have already announced their presidential run including, Julian Castro, Kamala Harris, Elizabeth Warren, and Cory Booker. In 2018, Klobuchar won re-election by a landslide with 60 percent. During the campaign, she held rallies in 87 Minnesota counties, including 47 that Trump won in 2016. Although Klobuchar generally votes liberal, she is not considered to be as liberal as some of the others running for president. She does not support abolishing ICE and does not agree with the Medicare-for-All bill put forward by Vermont Sen. Bernie Sanders. Instead, she believes the age should be lowered for individuals to be permitted to buy into government health care programs. Democrats question if her voting record, which tends to be more moderate, would be successful in the Democratic primary. Klobuchar supported Trump in his nominations of John Kelly, Mike Pompeo, and Wilbur Ross. FiveThirtyEight reports she voted 31 percent of the time for interests supported by Trump. 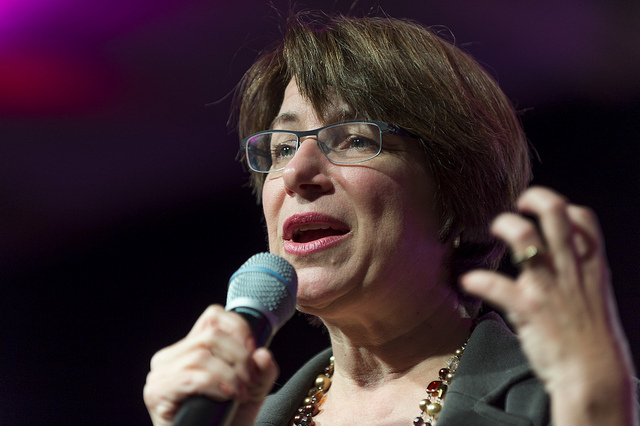 After the rally in Minnesota, Klobuchar plans on traveling on February 21 to Iowa where she is scheduled to speak at a fundraiser and the Ankeny Area Democrats Winter Banquet. One Response to "Amy Klobuchar Expected to Announce Presidential Run"
Good day! I simply wish to give a huge thumbs up for the great information you could have here on this post. I will be coming back to your blog for more soon.